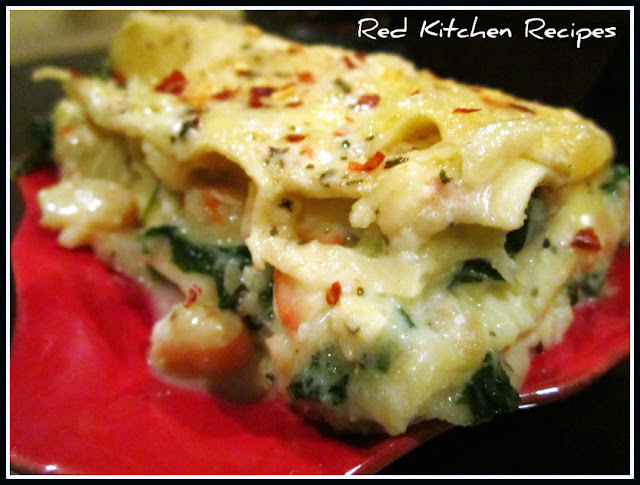 I started the seafood lasagna by sauteeing some shrimp, chopped cod, and crab with spinach in a large sautee pan. It's amazing how much spinach can wilt from a big bundle down to this! I added some mascarpone, an Italian cream cheese, to thicken the mixture slightly. Then in a medium saucepan, I made a bechamel, then melted some tomato and basil feta cheese in it. The tomato and basil flavor in the feta really gave the dish the delicious taste! Once again, I used a square pan because our small family wouldn't eat a big rectangular pan of lasagna on our own. If you wanted, you could double the recipe, make an extra batch in a foil pan, and freeze it. When it's time to cook it, let it defrost overnight, then cook at the same temperature. Another great cheese that can really add flavor to lasagna is fontina. I shredded the soft cheese on a box grater, then added it on top of the 2 seafood layers. It made the dish super creamy! In a large saute pan, add a light film of canola oil spray. When hot, add the shrimp, cod, and crabmeat with juices. Stir fry for a few minutes. Add the spinach, and stir until wilted. After a few minutes, add the mascarpone. Mix well, then remove from heat. In a medium saucepan, melt the butter, add the flour, whisk a minute or two, then add the milk while whisking. Continue to stir well, while adding the tomato & basil feta. Stir over low heat until melted. Preheat the oven to 350 degrees. Spray the bottom of a square pan with canola oil. Layer 3 lasagna noodles, slightly overlapping on the bottom. Spread a layer of half of the seafood mixture on top of the noodles. Spread a handful of the shredded fontina on top. Then, spread a third of the feta cheese sauce on top. Spread 3 more noodles on top. Spread the other half of the seafood, then the fontina, then the feta cheese sauce. Spread 3 more layers down. Top with the remaining feta cheese sauce. Reserve a handful of the shredded fontina. Cover with aluminum foil, then bake 40 - 50 minutes, until the noodles feel done. Remove from the oven, then sprinkle with the remaining shredded fontina cheese. Let rest 15 minutes before cutting. A pizza cutter works great! Garnish with crushed red pepper and parsley for a pretty presentation.